I recently did a small job for Penguin that reminded me how much fun I used to have working on branded websites for children. That was back when we could build entire websites in Flash, and the results were often more point-and-click adventure than anything you might expect on a conventional website. The upshot of this was often that nobody could find anything, and we usually ended up having to hide the fun stuff behind a boring HTML web page. Then the rise of smartphones pretty much obliterated Flash overnight and such websites became a rarity. One such site, on which I was the creative lead, was the Secret Show, winner of the 2007 interactive Children's BAFTA. Like so much of my work from that time it has long since vanished from the internet. 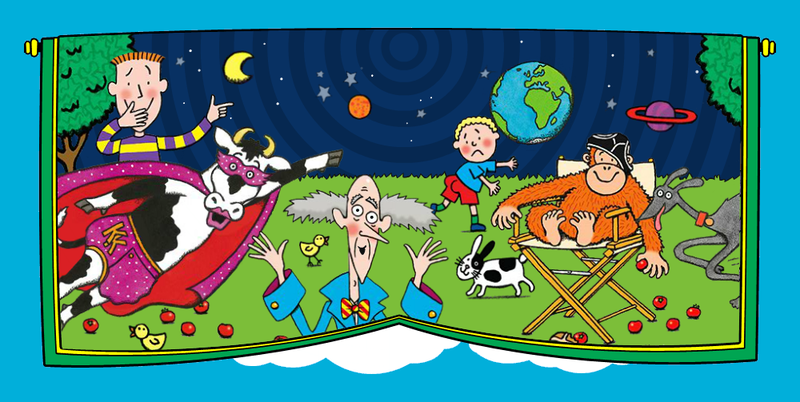 Anyway, all I had to do this time around was breath some life back into the homepage banner at children's author Jeremy Strong's website. This too had once been Flash, but all the lovely animation of Nick Sharrat's illustration had long been lost in the great Flash extinction of 20-whenever-it-was. It's arguably Flash now too, because I created the new animation in Adobe Animate (the successor to Flash) but the output is not the once ubiquitous .swf, but HTML5, as with my work for Transparency International. It's not much, but I had fun doing it. My previous animation jobs for Penguin include work for such brands as Peppa Pig, Spot and The Beano. You can find more information about this here.